There are many different species of sage, with some reports describing over 900 species. 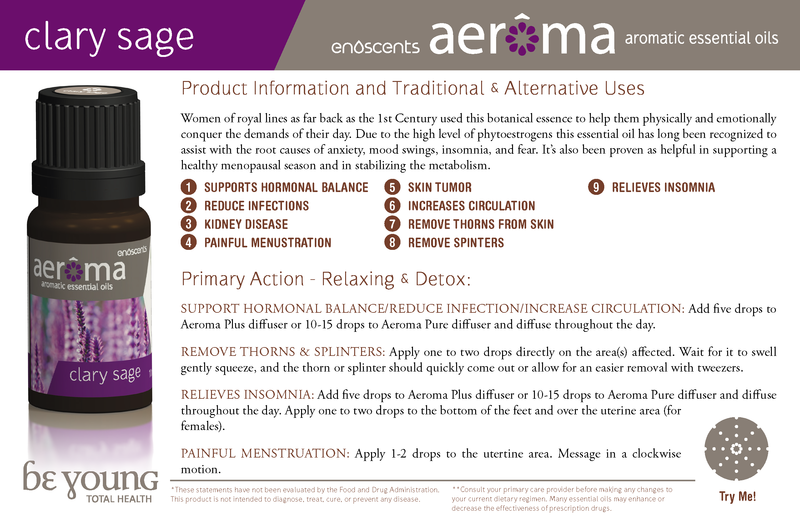 Ladies, it’s time for you to discover our Clary Sage Essential Oil. It is truly remarkable as it supports the proper development and function of all aspects unique to the female anatomy! Research shows that medicinal use of Clary Sage Essential Oil originates as far back as the 1st Century primarily among the female lines of royalty. Our clary sage, salvia sclarea, proves that unpleasant hormone and menopausal symptoms do not have to be “normal.” These issues which millions of women endure regularly are simply a manifestation that the female body’s delicate hormones are out of balance. Clary Sage is one of the ideal essential oils to help balance female hormones so that life can continue uninhibited without debilitating symptoms and roller-coaster emotions and disruptive discomfort. Clary Sage Essential Oil has also been proven as helpful in encouraging a healthy menopausal season and in supporting a stable metabolism. Clary Sage Essential Oil has a high level of phyto-estrogens which are so helpful to battle anxiousness, moodiness, and sleeplessness that seem so common place in our lives today. Apply lavender, clary sage and marjoram in a 2:1:1 ratio blend together and message over the uterus area to assist with dysmenorrhea.